I love the idea of creating cute and fun lunches to encourage my son to eat. But when it comes to breakfast it always seems like I'm stumped. Unless it's pancakes or waffles or some special egg dish how do I make it appealing? Here's a quick and easy idea I found for dressing up a simple cereal breakfast. Assemble the layers in a parfait cup as shown above. Serve and Enjoy. Stacy Julian of Stacy's Big Picture suggests you speak in a lame French accent when you serve this to make it even more special! I made this tote bag for my son for taking his toys, books and coloring things to church on Sunday. It was my hope for Sacrament survival. Needless to say, he's still getting hauled out of Sacrament weekly, but this does help. 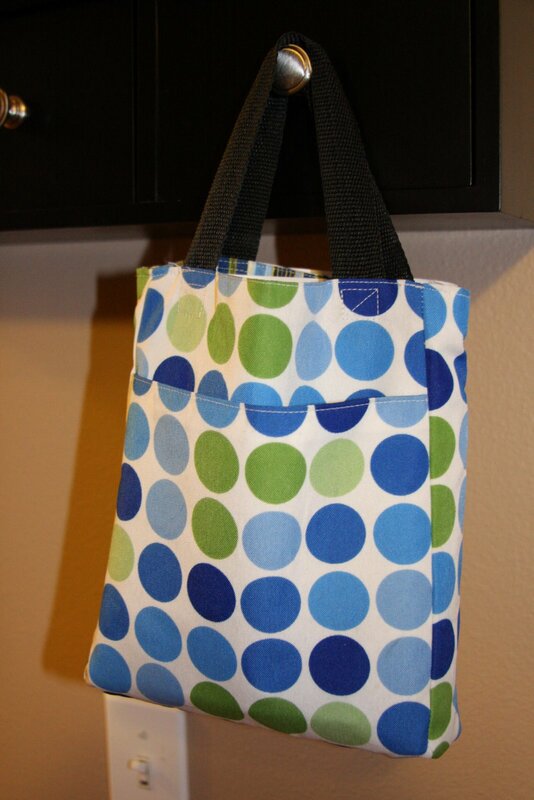 I used canvas fabric from one of my old diaper bags. I made the pattern myself and bought some cheap fabric to line it with. 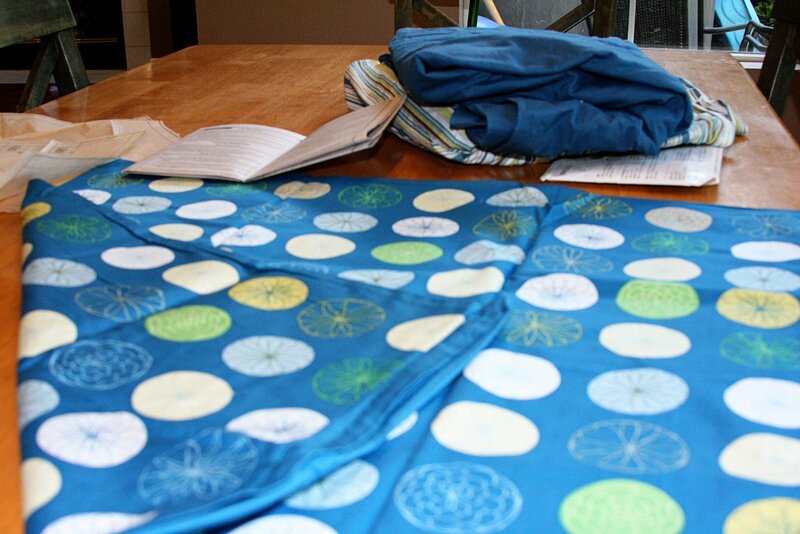 My other recent projects are from this fabric: A new diaper bag, and a tent for my son. I'll show you those soon. This is an extremely versatile recipe. In other words you can pretty much change the ingredients to suit your needs and it will still turn out! Preheat the oven to 450 degrees. Grease a 12 cup muffin pan. Mix the Bisquick Mix and 3/4 cup Milk then add milk slowly until you get a good biscuit texture. I mixed in just less than 1 cup of milk total. Mix it all together and kneed about 7 times. Divide into 12 balls. Flatten and spread across the bottom and sides of each cup in the muffin pan, forming biscuit cups. Bake for 2 min. Put the Onions in a small bowl and fill with water. In a skillet brown the Ground Turkey. Drain the fat, then drain the Onions and add them to the Turkey. Cook for another minute or so. (You can just throw in the onions dry, or use a fresh onion, I prefer to rehydrate them so the dry ones aren't too strong.) Remove from heat. Mix BBQ Sauce in with Turkey and Onions. 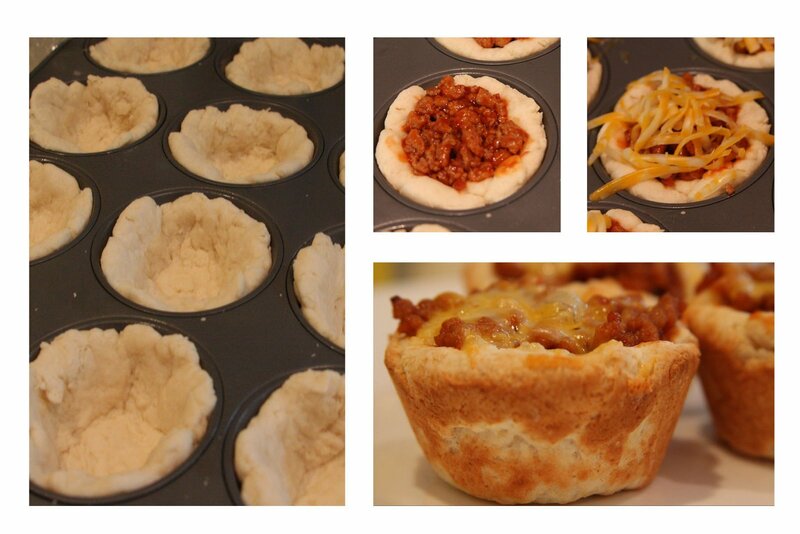 Fill the biscuit cups with the Turkey mix, cover all with grated cheddar cheese. Bake for 6 minutes. Remove from oven, cool, and enjoy! Like I said before these can be made with any variation you can think of: bacon or sausage and eggs, taco meat, use canned Sloppy Joe or Chili mixes (Manwich), use refrigerated biscuit dough or your own biscuit recipe, make your own BBQ Sauce, add your own special toppings (just like a taco if you use that, or gravy for breakfast ones), canned chicken with vegetables in a creamy sauce, or come up with your own family variation. 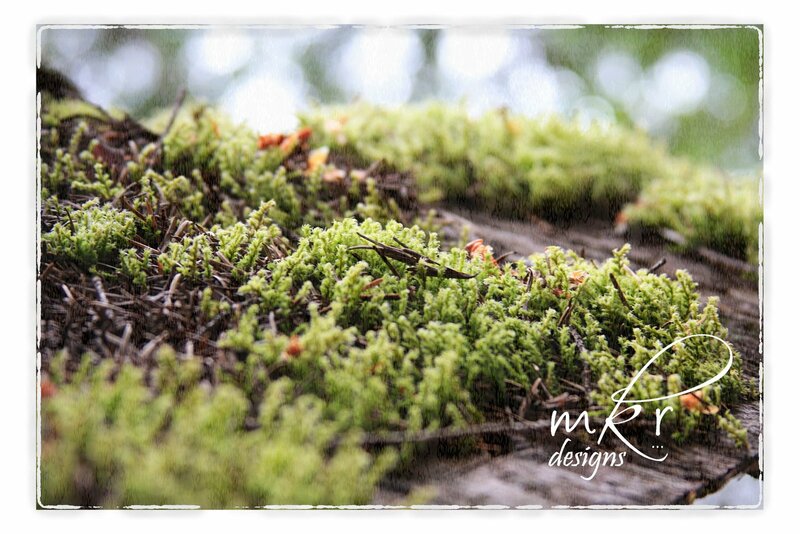 Just comment and let me know what variations you try so I can know what works. 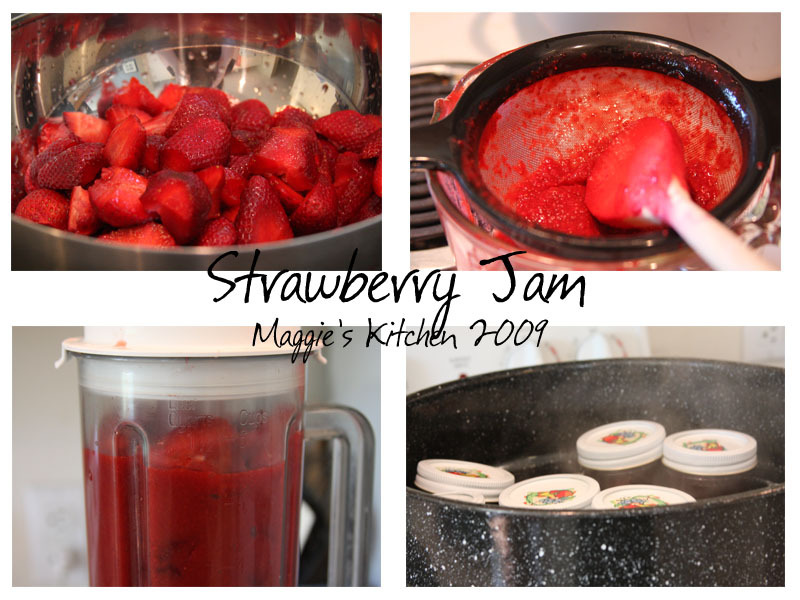 Do you love Strawberry Jam? It's the favorite flavor at my house. But we're picky. Both my husband and I prefer smooth jam. No lumps of fruit that you just can't spread. No seeds to get stuck in your teeth. Now that's jam! So where do you get jam like that? At home! Just a few weeks ago I made my first jam ever. We love it so much we've already gone through 2 jars. I guess that means I'm going to have to make more! I followed this recipe for the jam. Of course I pureed the jam in our blender and strained the seeds. It was a little extra work but well worth it. After cooking the jam to 222 degrees (just a little over what the recipe calls for) I canned it. It's a true work of art. After making more strawberry jam my next attempt will be blackberries. Yum!